I have recently watched a YouTube video by one Mr. Christopher McCarthy, a Vatican II sect apologist who goes by the moniker "The Marian Catechist." 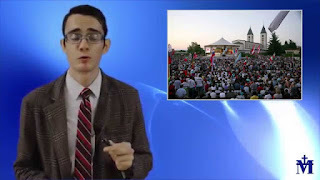 He puts up many videos, however the one I watched was entitled, "The Error of Sedevacantism." You may watch it at https://www.youtube.com/watch?v=OloVE_TuqkQ. Mr. McCarthy is smug, condescending, and obviously doesn't understand the things upon which he pontificates. Nothing was stated as to his theological education or occupation, and he presented himself as a layman. He makes glaring errors much akin to those who claim that (a) Traditionalist priests and bishops are valid but have no Ordinary Jurisdiction so you can't go to them, and (b) sedevacantism must be wrong because "we can't get a pope again, or we have to elect one ourselves." I begin to wonder if such people are really that culpably ignorant, or if they have an intent to deceive souls. I will address these (real) errors in this post. Mr. McCarthy informs us that "most sedevacantists believe that there has been no pope since the death of Pope Paul VI in 1978." I don't know of any Traditionalists who believe this, except for the Palmar de Troya conclavist-cult which claimed Clemente Domingues was "mystically crowned Pope Gregory XVII by Jesus Christ" upon the death of Paul VI. Most sedevacantists (myself included) believe that the papacy has been unoccupied since the death of Pope Pius XII in 1958; it is morally certain that the Chair of Peter has been unoccupied since the signing of the heretical document Lumen Gentium (with its false ecclesiology) by Paul VI on November 21, 1964. McCarthy then goes on to inform us that sedevacantists hold all popes since John XXIII to have been antipopes. True enough for the majority, but what about his prior statement concerning Paul VI? Does he even bother to check his research or examine his own videos prior to uploading them for the world to see? He calls sedevacantism "one of the dumbest theological errors I have ever encountered." Why, you may ask? Due to it's "false premise" that Vatican II contained heresy. He cites Vatican II apologist Michael Voris as a "Traditionalist" (!) who says there are no heresies in Vatican II. The documents are merely "ambiguous" and can be twisted by "liberal bishops." Well, that certainly settles it, no? Voris is neither a Traditionalist, nor a theologian. Even so, I could once more show the glaring heresies contained in Vatican II, but there is no need. Let's suppose, ad arguendo, that the documents are merely ambiguous. That, in itself, is a defeater for McCarthy's case in defending Vatican II. The Church teaches that God doesn't allow ambiguity to be taught by the Church! "In order not to shock the ears of Catholics, the innovators sought to hide the subtleties of their tortuous maneuvers by the use of seemingly innocuous words such as would allow them to insinuate error into souls in the most gentle manner. Once the truth had been compromised, they could, by means of slight changes or additions in phraseology, distort the confession of the faith that is necessary for our salvation, and lead the faithful by subtle errors to their eternal damnation. This manner of dissimulating and lying is vicious, regardless of the circumstances under which it is used. For very good reasons it can never be tolerated in a synod of which the principal glory consists above all in teaching the truth with clarity and excluding all danger of error. It is as if the innovators pretended that they always intended to present the alternative passages, especially to those of simple faith who eventually come to know only some part of the conclusions of such discussions, which are published in the common language for everyone's use. Or again, as if the same faithful had the ability on examining such documents to judge such matters for themselves without getting confused and avoiding all risk of error. It is a most reprehensible technique for the insinuation of doctrinal errors and one condemned long ago by our predecessor St. Celestine who found it used in the writings of Nestorius, bishop of Constantinople, and which he exposed in order to condemn it with the greatest possible severity. Once these texts were examined carefully, the impostor was exposed and confounded, for he expressed himself in a plethora of words, mixing true things with others that were obscure; mixing at times one with the other in such a way that he was also able to confess those things which were denied while at the same time possessing a basis for denying those very sentences which he confessed. This disposes with McCarthy's video quite easily. It is shoddy research coupled with sheer ignorance of Catholic theology. Now, on to the other two errors (not in McCarthy's video) about which I receive inquires or denouncements for not accepting them. There is no teaching (infallible or otherwise) that declares the Church can't exist without Ordinary Jurisdiction. Supplied jurisdiction is all that the Church needs to function in a time of emergency, such as we have now. We have at least two historical precedents for this fact: The Great Western Schism when a true pope was unrecognizable, yet bishops continued to be consecrated and act, and the interregnum from 11/29/1268 to 9/1/1271 (2 years and 10 months) between the death of Pope Clement IV and the election of Pope Gregory X. Several Diocesan Bishops died during this time. Ordinary jurisdiction can only be granted by the pope. However, nearby bishops consecrated a priest of the diocese to act with supplied jurisdiction (only supplying the sacraments) until the papacy could be restored. What happened when Pope Gregory X was elected? He praised the bishops who so acted (by consecrating those priests) thereby giving the people access to bishops and the sacraments. The bishops so consecrated, he ratified and then supplied them with Ordinary Jurisdiction. How Can Sedevacantism Be True If We Are Left With No Way To Get A Pope? Let me begin by stating that the answer is not as simple as getting someone elected by his mommy, daddy, and three other nice people on a farm in Kansas, as was the case with "Pope" Michael (David Bawden). If sedeprivationism was true, Bergoglio would need to publicly abjure his errors and get validly ordained/consecrated. The most probable way of restoring the papacy is an "imperfect General Council." Since all the validly appointed cardinals are deceased, there would need to be a rejection of the Vatican II sect as "Catholic." Some pre-Vatican II theologians pondered such a Council in the absence of cardinals. Indeed, theologian Van Noort pondered it as late as 1956 (See Dogmatic Theology 2: 276). Theologian Billot wrote: "When it would be necessary to proceed with the election, if it is impossible to follow the regulations of papal law, as was the case during the Great Western Schism, one can accept, without difficulty, that the power of election could be transferred to a...Council...Because natural law prescribes that, in such cases, the power of a superior is passed to the immediate inferior because this is absolutely necessary for the survival of the society and to avoid the tribulations of extreme need." (See De Ecclesia Christi). Then again, perhaps we are living in the end times, and the pope will not return. Who knows? Just remain in the state of Sanctifying Grace, and stay close to the Sacraments and Our Blessed Mother. Don't fall into the clutches of the Vatican II sect, or stay "Home Alone" because of those who either refuse to heed the truth through obstinacy, or desire your damnation through deceit. From time to time, Traditionalists will hear their clergy attacked as "invalid" or "illegitimate." Having been a member of the True church since 1981, I've heard these stories rise up, again and again, like a monster in a horror movie that can't be killed. No matter how well the arguments and objections against Traditionalist clergy are refuted, they come back to haunt us. The danger lies in those new to the Church, who might have their Faith jeopardized by specious arguments. After reading your articles, am I correct that you don't consider yourself a priest or bishop (having derived your orders from the Old Catholic sect)? You also reject all orders coming from Abp Levebvre and Abp Thuc. To whom do Catholics go to for valid sacraments?" " I am convinced that the proof of the validity my Holy Orders does not meet the Church's criteria of moral certitude. I may very well be a bishop, but moral theology is clear - one may not exercise Holy Orders unless they can be established as morally certain. To whom do Catholics go to for the Sacraments? I wish that I knew, but I don't. I've decided to write a post against his article entitled, "Traditional Catholics - Do Your Clergy Possess Valid Orders?" (See http://bishopjosephmarie.org/doctrine/invalidorders.html#no authority). I have discussed some of these objections in the past. I will collect everything here. I will answer his objections to Abps.Thuc and Lefebvre's orders. There are those who only attack a specific episcopal lineage (Lefebvre, Thuc, Mendez, Dolan), those who attack the validity of all lineages, and those who attack all lineages as being "valid but illicit" due to a perceived lack of jurisdiction. I will limit myself to the two archbishops' validity. In so doing, I hope I may preserve the Faith of those Traditionalists who are given false and unreasonable doubts about their clergy. As "Bp." Joe's article is prolix, I will present the crux of his arguments with refutations. I provided the web address above for anyone interested in reading the whole monograph. As per usual, Lefebvre's Orders are attacked on the supposed lack of intention "to do what the Church does" on the part of his ordaining and consecrating bishop, Achille Cardinal Lienart, an alleged Freemason. For the sake of argument, I will concede that he was a Mason (but there is plenty of doubt if he was a member of the Lodge). “[T]hey [Freemasons] declare repeatedly that Christ is either a scandal or foolish; indeed, not rarely, that there is no God, and they teach that the soul of man dies together with the body: the codes and statutes, by which they explain their goals and ordinances openly declare that all the things which We have already mentioned, and which pertain to the overthrowing of Legitimate Rulers and totally destroying the Church come forth from them. And this has been ascertained and must be considered as certain, that these sects, although in name different, nevertheless have been joined among themselves by an impious bond of filthy goals.” (Quo Graviora – Apostolic Constitution of Pope Leo XII, March 13, 1826) ..."
There follows many more citations, NONE of which state that Masons have a positive contrary intention (i.e. not intending to do what the Church does when conferring a sacrament). Compare the teaching of the Church about sacramental intention: When a bishop confers Holy Orders using correct matter and form, he must be presumed to have had a sacramental intention sufficient to confect the sacrament — that is, at least "to have intended to do what the Church does." According to theologian Gasparri, a bishop is never presumed to have a positive contrary intention unless proven by those who assert such. "In performing an ordination the minister is never presumed to have such an intention of not ordaining, as long as the contrary would not be proved. For no one is presumed evil unless he is proven as such, and an act — especially one as solemn as an ordination — must be regarded as valid, as long as invalidity would not be clearly demonstrated." (Gasparri, Tractatus de Sacra Ordinatione [Paris: Delhomme 1893], 1:970--Emphasis mine). Gasparri does not state that Masonic membership is a presumption of evil such that the minister would be "clearly demonstrated" as having a positive contrary intention. "Bp." Joe counters: "The defenders of Lefebvre, however, would have us believe that if an enemy of Catholicism visibly used proper matter and form in their ordination and consecration ceremonies, then we have no choice but to accept that intention as good and the Sacrament as valid. This is not sound sacramental theology and a highly dangerous proposition, because in accepting this line of reasoning, one would have to enslave and subordinate the intention of the minister to the matter and form employed. Taking this line of reasoning to its logical conclusion, then if Anton LeVey, the founder of the Church of Satan, were to consecrate someone (supposing that he himself had obtained valid consecration, as Satanists sometimes did) by using proper matter and form, then we would have to accept that consecration at face value as being valid. But what intelligent person would accept this? What serious-minded Catholic would go to such a person for the Sacraments or entrust the welfare of their souls to him?" As to the hypothetical concerning Anton LeVey, if he seriously performed the Catholic rite, we must accept him as having the requisite intention unless he specifically states the contrary. Is it crazy to think so? Hardly. Why wouldn't he want priests to confect the Eucharist so as to desecrate it? Why not ordain a priest that he knows to be unworthy and will bring scandal to the Church? Masonry is evil (and all that this entails) and the destruction of Catholicism is one of its main objectives. Those who become Freemasons are automatically excommunicated from the Church. Beyond this, the Church is essentially silent regarding Masonry. But the pro-validity group has determined that this silence is actually proof of something, i.e., that it proves that Masonic ordinations and consecrations are in fact valid. An interesting conclusion, but one void of merit. Silence has evidentiary value, granted, but silence alone is proof of nothing except silence. That is why no court of law in any civilized country will ever convict a person based on silence alone. It is inconclusive. That presumption favors the validity of a Sacrament is not debated. This is the general rule and I am unaware of anyone who denies this. The fact that the pro-validity group keeps making this an issue is bewildering and seems to serve no other purpose than to provide them with a straw-man to beat up. No one denies that in the ordinary course of events, that when a bishop performs ordinations and consecrations, that they are to be accepted as valid – that’s the norm. But many rules admit of exceptions; and as has already been noted in this article, Freemasonry is one such exception. This exception to the rule has not been directly stated about Freemasons, true; but that it can be derived from certain principles is obvious. In fact, it is so obvious that I am not in the least surprised that it has rarely been addressed – it is a self-evident truth. Every minister of the Sacraments has the capacity to destroy the validity of the Sacraments by an adverse intention alone. Freemasons, as declared enemies of Catholicism, must be presumed to have an adverse intention to Catholicism. In the normal course of events, one who possess the capacity to carry out his intentions, does so. It’s so simple: Liénart, as a Mason, was a declared enemy of Catholicism. He had the capacity to destroy the Sacramental Orders of Marcel Lefebvre." "Still it must be confessed that the number of the enemies of the Cross of Christ has in this days increased exceedingly, who are striving, by arts, entirely new and full of subtlety, to destroy the vital energy of the Church, and, if they can, to overthrow utterly Christ's kingdom itself." (See Pope St. Pius X, Pascendi Dominici Gregis, 1907). Therefore, if the Modernists want to "overthrow utterly Christ's kingdom itself," they too wish the destruction of the Church, like the Masons. Should we therefore consider any Modernist as having a positive contrary intention? Considering that a majority of the prelates in 1962 were Modernists (suspected of heresy, or "in the closet" until Vatican II) what doubt would that place on most sacraments the world over? Cardinal Frings was the de facto leader of the Modernist faction at Vatican II. Must we consider all his sacraments as being invalid for having a positive contrary intention since Modernists wish to destroy the Church also? Replace "Freemasons" with "Modernists" in his above syllogism, and we would necessarily have to hold all their sacraments "dubious" or "invalid" as well. This would mean that the hierarchy would be suspect beginning in the latter half of the 18th century. Does he really expect any thinking person to accept this nonsense? No citation is given to the alleged death bed "confession" of Lienart wherein he asserts he held a positive contrary intention. The only place I found such stated (unsourced) was in a blog by Hutton Gibson, father of actor Mel Gibson, and one of the first "Home Aloners." I would put this in the same category as the supermarket tabloids with pictures of Bigfoot on a UFO. Abp. Thuc is alleged to have doubted Lefebvre's Orders at one point, but even if true, it merely shows that Thuc was fooled by those claiming Masonic membership equals a positive contrary intention--in much the same way he was fooled for a time by the false apparitions at Palmar de Troya, Spain. Translation: "Wish upon a star" means that he has not one pre-Vatican II theologian to back up his false presumption about Masonry and defect of intention. If the fact of Masonic membership makes sacramental intention lacking, one would expect theologians (especially the French where Masonry was virulent), making this argument or at least debating the issue. Instead we find nothing. French theologians and canonists such as Billot (De Ecclesiae Sacramentis, Rome: Gregorian 1931, 1:195-205), Many (Prae. de Sacr. Ordinationae 585-591), and Naz ("Intention" Dictionnaire de Droit Canonque, Paris: Letouzey 1953, 5:1462), who otherwise discuss sacramental intention at length, have NOTHING to say about doubtful/invalid sacraments from Masons. However, good ol' "Bp. Joe" knows better than they do! In this case, Joe, silence screams. We have already covered earlier in this article the Church’s minimal requirement for a valid sacramental intention, that of simply intending "to do what the Church does." This is not a difficult hurdle to get over. In fact, it is such a low hurdle, that one does not even have to know what is the Church’s intention regarding any particular Sacrament, it suffices simply to intend “to do what the Church does” in bestowing that Sacrament. That’s all that is required. Nevertheless, "to do what the Church does" in conferring a Sacrament means to do it according to the mind of the Church. That is self-evident. If one intentionally does something differently than the mind of the Church, he cannot claim that he has the intention of "doing what the Church does." But our Sacraments only bishops don’t believe that this power to rule and to teach applies to them. They openly proclaim that they do not posses it. Therefore it stands to reason, that when they confer or receive episcopal consecration, that they do not intend to bestow or receive these two powers. This calls into question the sufficiency of their intention. The mind of the Church is to bestow the three powers of sanctifying, teaching and ruling, as the Sacrament of Consecration clearly shows. The mind of our Sacraments only bishops is simply to bestow the power of sanctifying while omitting the other two powers of teaching and ruling. In so doing, they clearly intend something different than what the Rite itself intends. But, wait a minute--if you don't need to intend to produce the effects of the sacraments (such as forgiving sin in confession) as theologian Ott teaches, why would you need to intend to give bishops the power to teach and rule? This issue of Masonic Sacramental intention was indirectly addressed by a respected theologian, Augustin Lehmkuhl, in an actual case regarding a priest named Fabricius, who had become a member of a forbidden society. While Lehmkuhl does not specifically mention Masonry by name, that Masonry is a forbidden society is disputed by no Catholic, and so Lehmkuhl’s conclusion on the sacraments conferred by someone who had joined a forbidden society is justifiably and appropriately applied to Masonry as well, for no rational argument can be made as to why it would not apply. There are two notable points of interest here. Firstly, Lehmkuhl makes no exception for validity regarding any of the Sacraments: "the sacraments conferred by the priest were null." Every Sacrament that this priest ostensibly confected since his membership in the forbidden society was invalided. None of them took place. Secondly, and more importantly, he declares that all of the Sacraments conferred by this priest to be repeated “absolutely.” In stating that they are to be repeated "absolutely" rather than repeated "conditionally," Lehmkuhl is making it clear that he considers the Sacraments conferred by Fabricius, since his membership in a forbidden society, to be not simply doubtfully valid, but rather certainly invalid. For according to Church law, if there was a prudent doubt as to their validity, then they would be repeated "conditionally," not "absolutely"
I have fully referenced the citations. Lehmkuhl appears in DeSalvo's work on page 103 as an example of a merely external intention being insufficient to confect a valid sacrament. Lemkuhl NEVER declares sacraments conferred by those in secret societies to be invalid or dubious. In the case of Fabricus ("fabricating" sacraments? Sorry, I couldn't resist!) of course all his sacraments were invalid; not due to his membership in a secret society or even his loss of faith, but because he withheld his intention and manifested it!
" Provided the minister seriously performs all the sacramental rites, there is no need for being doubtful about the validity of the sacraments, for it is presumed that the minister has the requisite intention, unless he externally manifests the contrary." I'll go by DeSalvo's conclusion over Joe and the pseudo-theologians whom also go around propagating this nonsense. They also commit the logical fallacy of "post hoc, ergo proper hoc" ("after this, because of this"). They wrongly assume that it was Fabricus joining the secret society that caused his contrary intention. This is analogous to saying, "The rooster crowed when the sun rose, so it was the rooster that caused the sunrise." No such principle of membership in secret societies and automatic lack of intention was stated by either Lehmkuhl or DeSalvo. Talleyrand died reconciled to the Church. But isn't it possible he lied about not withholding his intention to make it SEEM like he was reconciled to the Catholic Church, thereby fooling people into thinking his consecrations must have been valid, and thereby better serve Satan? Possible explanations do not equal probable ones. Its possible that Elvis is still alive at 81, but I won't be trying to see if I can locate him in my local supermarket. This idea of various "solutions" to save invented principles is pure speculation. The practice of the Church is in conformity with Her teachings, as in this case. Finally, Bp. Saurine of France never wrote about having the requisite intention, yet the Church considers him a bishop without reconsecration, and the orders and sacraments that derive from him to be valid, even though he belonged to the most Catholic-hating Masonic Lodge in Europe. The case he presents against Abp. Thuc is easier to refute since he concedes him to be a true bishop. The entire case boils down to (a) his mental state and (b) his integrity because he allegedly "simulated" sacraments. He writes: Much of what I present below is an attempt to counter-balance the factual misinformation which seems prevalent everywhere regarding Bishop Thuc. So far, it's been amply demonstrated that all the misinformation has been coming from you, "Bp." Joe. Almost all Traditionalist bishops in the Thuc lineage derive from the consecrations of Guerard des Lauriers and Moises Carmona, both in 1981.The fact that he consecrated unworthy candidates has nothing to do with the issue. Abp. Lefebvre ordained Fr. Juan Fernandez Krohn, who was seriously disturbed and attempted to assassinate John Paul II with a bayonet. This has no bearing on the validity of the archbishop's sacraments. Conclusion: The Archbishop validly performed the consecrations of these worthy and properly trained candidates. 2. Did he simulate sacraments? In a word; No. The only proof offered for his alleged simulation of a consecration is a hearsay statement made in The Angelus, an anti-sedevacantist publication of the Society of St Pius X (SSPX). As to his simulating the Novus Bogus, a false charge. He refused to receive "communion" at the service and therefore, "simulated" it. Thuc simply misspoke. He NEVER claimed to have withheld his intention or had a positive contrary intention. As a matter of fact, since the service was concelebrated by a Vatican II bishop (validly consecrated), assuming ad arguendo that the Novus Bogus is vaild, there is nothing that Thuc could have done to invalidate it. The intention of the bishop alone suffices, and Thuc holds a doctorate in theology, so he knows this fact. He simply misspoke. There is no reasonable doubt as to the validity of the episcopal lineages of both Abps. Thuc and Lefebvre. The Church will exist until the end of time. The gates of Hell shall not prevail. I'll write about jurisdiction at a later date. Please avail yourself of the sacraments from Traditionalist priests and bishops without worry. Don't let "Bishop" Joseph Marie, and other "Home Aloners" keep you away from Christ in the sacraments. As theologian Halligan teaches, every sacrament "may possibly be invalid or valid." (See The Administration of the Sacraments, NY: Alba House , chapter 1, pg. 23--emphasis in original). We don't live in fear of mere possibilities; we act upon that which is highly more probable than not. It is possible that I could slip and fall in the shower and be paralyzed for life. Is it probable if I'm careful? Need I worry about it? We can have moral certainty of our Traditionalist clergy's orders, and that's all we ever need. Otherwise, you'll end up a sad person sitting at home, like "Bp." Joe, who is only certain about his doubts. The Swiss apostate, Fr. Hans Kung, has made the news again. He called on fellow apostate Jorge Bergoglio (aka "Pope" Francis) to allow "an open and impartial discussion on the infallibility of the pope and bishops." The false pope responded in the affirmative, and according to Kung (who has a personal letter from Frankie), there will be "no restrictions" on the "discussion." Fr. Kung was born in 1928 and was ordained to the priesthood in 1954. He was the youngest peritus (i.e., theological expert) at Vatican II. Along with his Modernist comrade, Fr. Joseph Ratzinger (later "Pope" Benedict XVI), they eschewed clerical garb and chose to wear a suit and tie instead. Kung and Ratzinger were on the side of the heretical Rhineland bishops, serving their de facto ringleader, the despicable Joseph Cardinal Frings. They were a constant voice for Modernism, and sabotaged the efforts of the Traditionalists at every turn. My spiritual father, Fr. Gommar A. DePauw, JCD, was a peritus for Cardinal Ottaviani and Bishop Blaise Kurz in their attempt to stop the Modernist takeover. Fr. DePauw told me of how Ratzinger and his allies battled him frequently at the Council, and were largely responsible for the Great Apostasy in pushing through their heretical agenda. Interestingly, Ratzinger would turn on his former friend in the 1970s when he was "campaigning for pope." To ingratiate himself with Wotyla (John Paul II), he had Kung's ability to teach as a "Catholic" theologian at "Catholic" institutes of higher learning revoked when Kung refused Ratzinger's order as head of the "Congregation for the Doctrine of the Faith," to change some theological opinions in two books. Ratzinger helped Wotyla seem "consevative" whilst dismantling all that was Catholic from their new sect. Twenty-six years later, he was rewarded by becoming the next false pope, and he made amends with Kung. For those in "conservative" Vatican II sect circles, the news of Kung's request and Frankie's reply were met by gasps. For those of us Traditionalists, it was no shock that Kung is on the verge of getting all he ever wanted--the final transformation of what is still wrongfully called the "Roman Catholic Church" into a one-world, dogma-free religion. In the 1965 book-compilation entitled The Great Themes of the Council edited by Fr. Alting von Geusau, Kung wrote one of articles for the collection. The following is a pertinent quote, "The Council was convened by the Holy Father to prepare for reconciliation...the final aim of the Council: reconciliation with the separated Christians... It is also not, as many Christians would desire - especially the Catholics, by tranquilly inviting the others to come to their own Church - as if the others had something for which they needed to be forgiven - or through the conversion of individuals .... or simply by a general reform of customs .... Vatican II saw its mission in a very different way: reconciliation with the separated Christians can only be accomplished by means of a renewal of the Catholic Church herself. " (pgs. 103-105; Emphasis mine). Kung makes clear that there is to be a corporate reunion, not by converting others to the Truth, but by "renewal" (read: "subverting"). 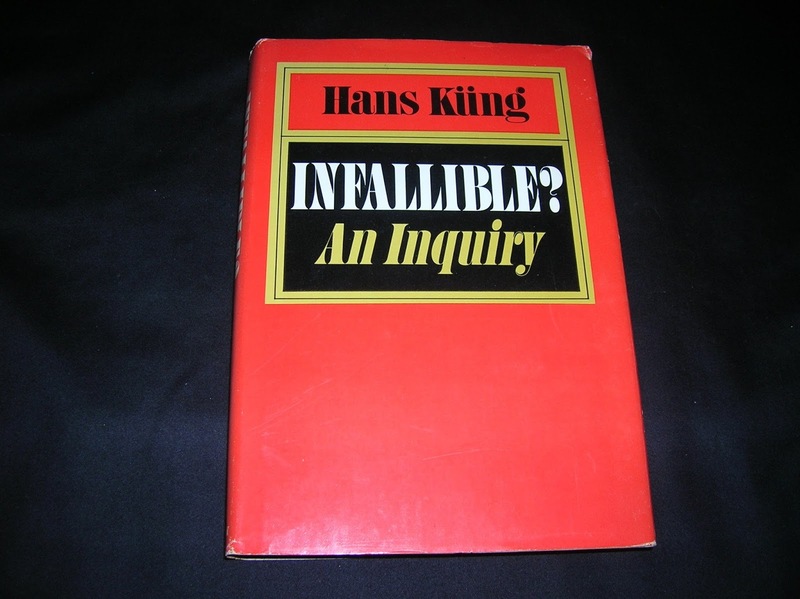 In his 1970 book Infallible? An inquiry, Kung asked for the same thing he asked of Frankie this year; "open debate" on the topic by (Modernist) theologians. 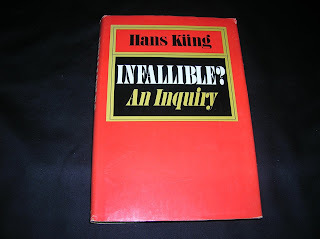 Ratzinger wrote an article entitled "Contradictions in the Book Infallible by Hans Kung" wherein he appears to defend the dogma. All he did was support change to the dogma, but claimed Kung goes too far (at least in the 1970s). Ratzinger wrote, "I want to emphasize again that I decidedly agree with Kung when he makes a clear distinction between Roman theology (i.e. Scholasticism) and the Catholic Faith. To free itself from the constraining fetters of Roman Scholastic Theology represents a duty upon which, in my humble opinion, the possibility of the survival of Catholicism seems to depend." (Word in parenthetical mine). What does the True church teach? From the book, "As in Montanism, some post-Tridentine visionaries have been dominated by apocalyptic conceptions (prophecies of an imminent end of the world, a great war, an apocalyptic catastrophe, or the conversion of Russia), which causes in the devotees terror and, at the same time, attraction and fascination. This is one of the reasons for their astonishing success... As in Joachimism, there are mystical numbers and anticipated dates: important events have taken place on the 13th day of the month ....As in Joachimism, a new religious congregation is often considered necessary to spread the ideas according to which .... a specific work of piety (a statue, a devotion, a medal) is considered as important as the Word of God witnessed in Scripture. " Montanism was a second century heresy, and Joachimism refers to the 13th century monks who were fixated on end of the world prophesy. While no one needs to believe in apparitions and private revelations, and it is not sinful to do so (unless such rejection stems from contempt for Church authority), Kung denigrates Fatima for being a manifestation of the supernatural, condemning such beautiful practices as the Five First Saturdays as some sort of "superstition" and (in typical Protestant fashion) exalting the Bible above all else. According to the May 26, 2007 edition of The Tablet, we read on pg. 39, "The architect of the Global Ethic Foundation, the Swiss theologian Hans Kung, has been awarded the German Freemasons' Culture Prize. Grand Master Jens Oberheide said that the ideal of a common, ethical foundation based on human rights and the demand for freedom, equality, and fraternity that underlay Kung's foundation, was also 'fundamental' for Freemasons. Although the Vatican has rejected Freemasonry, Kung said the award was an encouragement and added, 'Hope...accompanies every new beginning." According to religioustolerance.org, Kung's Foundation put forth a declaration in 1993 which, " ...was signed by 143 respected leaders from all of the world's major faiths, including the Baha'i Faith, Brahmanism, Brahma Kumaris, Buddhism, Christianity, Hinduism, Indigenous, Interfaith, Islam, Jainism, Judaism, Native American, Neo-Pagan, Sikhism, Taoism, Theosophist, Unitarian Universalist and Zoroastrian. The Council for a Parliament of the World's Religions offers it to the world as an initial statement of a group of rules for living on which all of the world's religions can agree." It is perhaps no surprise that someone who has spent a lifetime opposing the teaching of his own church on so many different issues (to the complete confusion of Protestants such as myself, I hasten to add) should choose to end his life in breaking one last church taboo. It is surprising, though, that his reasoning seems so weak. The analogy between birth and death seems entirely inappropriate to the case Kung is trying to make. His birth, after all, was no more his responsibility than my birth was mine. That is not just basic Christian teaching; it is a really rather obvious fact of life. Herr Kung, now age 88, wants to see the spiritual death of whatever remnants of Catholicism remain in the Vatican II sect before he kills himself to be with Satan, his master. He is one of the most evil men to have ever lived for his work in advancing the Great Apostasy. By removing the dogma of infallibility with the help of Francis, he will have eviscerated the very idea of a Teaching Authority, or Magisterium. 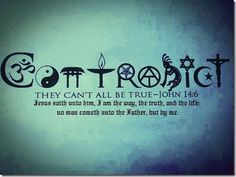 There will be no real obstacles left to a world-wide religion when no one can be sure of anything and "Do what thou wilt shall be the whole of the law," is the "global ethic." I wonder how many people see the self-contradictory irony in Kung's world where the adage, "There is no immutable, infallible, and unchanging truth," is the only immutable, infallible, and unchanging truth to which he demands that all must submit.